Pharynx is the 4-5 inches long semicircular fibromuscular tube, commonly referred to as the throat  that connects the nasal cavity to the larynx, and the oral cavity to the esophagus [2, 3]. Located just below the nasal and oral cavities and before the larynx and esophagus, the pharynx starts at the human skull base, extending to the lower end of the cricoid cartilage . It is the uppermost section, located between the skull base and the soft palate . The adenoids or pharyngeal tonsils are located on its posterior wall . 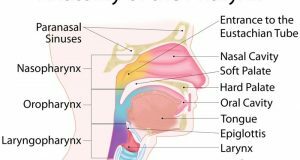 The part after the nasopharynx, the oropharynx is the region behind the base of the tongue, between the soft palate and the epiglottis . Also known as the hypopharynx, it is the last section of the pharynx, located between the epiglottis and the cricoid cartilage, continuing into the larynx and esophagus . Inferior pharyngeal constrictor, also located in the Laryngopharynx, divided into the superior (having oblique fibers attaching to thyroid cartilage) and inferior (having horizontally placed fibers attaching to cricoid cartilage) components . The vagus nerve innervates the palatopharyngeus and salpingopharyngeus, while the glossopharyngeal nerve innervates the stylopharyngeus . Arterial Supply: Through external carotid artery branches, namely the ascending pharyngeal artery, lingual artery, facial artery and maxillary artery. Venous Drainage: Performed by the venous pharyngeal plexus that drains into the IJV (internal jugular vein). 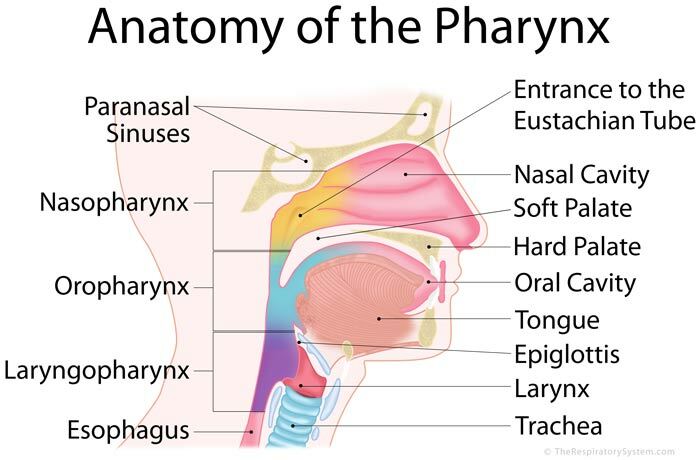 Since it works as the connecting tube between the nasal cavity and larynx, as well as the oral cavity and esophagus, the pharynx is an integral part of both the respiratory and digestive systems. Here, its primary purpose is to let inhaled air pass from the nasal cavity to the larynx, windpipe and then the lungs . The passage connecting the oral and nasal pharynges, called isthmus, allows humans to breathe both through the nose and mouth . The epiglottis, located at the end of the oropharynx keeps the passage to the esophagus covered, so the air does not enter into the digestive system. The Eustachian tubes act as a connection between the pharynx and middle ear, helping in equalizing the pressure of air on the eardrum . The consecutive contractions of the circular muscles of the pharynx help the ingested foods to pass through the lumen into the esophagus . The longitudinal muscles contribute to widening the pharynx, elevating the larynx during the process of swallowing . The pharynx works with the other speech organs and muscles to produce initial sounds, while it also plays the role of a resonating organ. Pharynx cancer, causing a lumpy feeling in the throat or neck, bleeding, nasal obstruction, ear and throat pain, problems with swallowing and even deafness .